Feels like a good day to have a giveaway! Am I right? How about a chance, or many chances, to win a Knickernappies Doorknob Pail? Our Doorknob Pails are pretty special and quite popular among cloth diapering families and we just know that you all would love it if you win. Sometimes there's just not enough space for a plastic diaper pail. 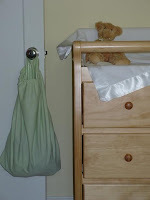 Doorknob Diaper Pails are perfect for nurseries, bathrooms, and traveling. All you need is a doorknob! The Doorknob Diaper Pail attaches securely with snaps but still allows the doorknob to function normally. The pail naturally gaps open just enough to drop in a diaper and is easily washed along with diapers in the washing machine. Also features a sewn-in fabric swatch to use with a drop or two of essential oils to help control odors. Doorknob Diaper Pails are made with waterproof PUL. They don't have drawstrings or cords, just elastic and snaps. Enter to win a Knickernappies Doorknob Pail in the color of your choice via the Rafflecopter Form below. Open to the USA & Canada. All winners entries will be verified. Fluff Envy is our closest retailer. The closest retailer to me is Diaper Lab. Snuggle Hugs is the closest retailer. The closest retailer to me (@ 92.2miles) is Northern Essence. Tidee Didee in Portland, OR! punkinhead kids in calgary, alberta is closest to me. Abby's Lane is closest to me! Not my nearest but fave? Abby's Lane! My closest is No Sugar Added - 193 miles away in Claremont. Crazy! My nearest retailer is The Little Seedling. Go Baby Go! in San Antonio is the closest at 220.2 mi. away! The retailer that is closest to me is RG Natural Babies in Racine, WI. Belly2bottoms is the closest. Had no idea! circle ME is my closest one! A Mother's Touch near Ottawa. I've bought from Karen before, she's amazing! The closest one is EcoBuns in Holland (MI). Only 294miles away! Baby Cotton Bottoms 6 1/2 hours away :( I think I'll have to stick with online shopping. Petticoat Fair is the closest to me. Luvaboo's in Rochester, NY!! My fav place to buy cloth diapers!! Baltimore, MD is the closest retailer. The nearest retailer is Soft and Cozy Baby in Baltimore.